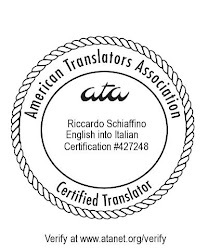 The end of the year is a good time to see how our translation business is doing. Corinne McKay, in Thoughts on Translation, already published a good list of things to do. My list has a narrower focus: a good look at the data from the past year to see what went well, what didn’t go so well, and what to change. Create a list of all the invoices you issued during the year. Add all the invoices up, to get your total turnover for the year. Sort your list in decreasing order (i.e., you should have a list that starts with your best customer, and shows the total invoiced amount for this customer, then your second best customer, with the total invoiced amount, and so on). Calculate the increase or decrease of the invoiced amount for each customer over the previous year. For this you need a similar list for your previous year. If you don't have it, this is a good time to create it from the previous year final data. Calculate the percent increase or decrease for each customer over the previous year. Note which customers are new, which stopped sending you work, which have increased turnover, and which have decreased it. Check how the income from those customers has gone up or down (bear in mind, though, that correlation is not causation). Analyze your projects in whatever other ways you think most useful to give you a good picture of your business. For example, while two customers may both have assigned you $ 2,000 worth of work, they may be different if one has sent you ten $ 200 projects throughout the year and the other customer a single $ 2000 project. Try to decide which has the most upward potential (e.g., asking the "small projects only" customer if they can give you larger projects, or the "one big project" customer whether they have more frequent jobs). Analyze your projects by sorting them by language pair, subject matter and so on. If you find you would like to know something about your past performance that the data you have cannot tell you, think how to change your accounting and record keeping so as to gather the new data in the future (but also think whether the necessary changes in your workflow would be worth the trouble). List all equipment, software licenses and other things you bought for your translation business during the year. List all subscriptions to professional publications, memberships, etc. you pay for your business. List all domain maintenance fees, hosting fees etc. for you net presence. List all services you pay for your business, such as utilities, telephone, Internet, online backup services (but remember that if you use these services also for your personal use, you should only count the portion you actually use for business). List all the marketing expenses for your business (brochures you brought to professional conferences or that you sent to prospects, e-marketing expenses, etc.). Once you have listed all your professional expenses, you should analyze them to see what was well spent, things or services that you may not need any more (a good candidate for trimming could be your fax service, if you are finding that it is no longer used or necessary, for example), and things or services where the investment of more money spent would be helpful. Some of the operations above are only possible if you already had similar data from the previous year. If you don't have the data, collect it starting for this year, so that next year you'll be able to run a more detailed analysis. Knowing that I earned $25,000 from ACME and $18,500 from BETA does not really tell me which client is better. For instance, if I spent 800 hours working for ACME and 400 hours for BETA, then BETA is a better client than ACME. Unfortunately this kind of information is very hard to get. The number of words translated is not very meaningful, as output varies depending on the project type. I have tried ways to keep track of time spent for each client, but always found them too cumbersome. I've sent you an e-mail to the account specified in your blog. But the delivery fails. Could you please give me a valid e-mail account? I regularly check my blog traffic, and delete comments that do not contribute to the discussion, but that are added here just to provide a free link to your web sites (especially when these sites seem to have the aim of helping bad students cheating on their homework).